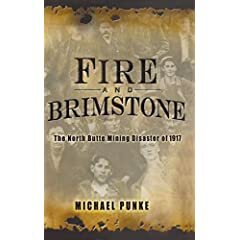 This is an interview with Michael Punke, author of Fire and Brimstone : The North Butte Mine Disaster of 1917 (Hyperion). Q: What was the North Butte disaster of 1917 and how did it start? A: The North Butte disaster was the worst hard-rock mining disaster in U.S. history. It began in a Butte, Montana mine called “Granite Mountain,” a property owned by the North Butte Mining Company. On the morning of June 8, 1917, a crew was lowering a massive 1,200-foot, electric cable into the mine. The cable slipped, crashing down the shaft and eventually sticking in a giant clump about 2,400 feet below ground (still more than 1,000 feet from the bottom of the shaft). The material used to insulate the cable was flammable, and when a recovery crew went to pull it out, a crewman’s open-flame lantern set the cable ablaze. The fire then spread quickly up the wood-timbered shaft. Q: How is the 1917 disaster relevant to mining today? A: There is a tragically predictable pattern in the history of mining that we see playing out today. Increased commodity prices often lead to decreased attention to safety. In 1917, the increased prices for copper resulted from World War I. Today, price pressure on energy comes from sources including rising China demand and the destruction of refining facilities by Hurricane Katrina. In both 1917 and today, increased prices led to a blinding focus on what the Butte miners called “getting the rock in the box.” Safety became a far lesser concern, with certain and disastrous results. Equally predictable, disaster spawned demands for reform. A well-known phrase among miners is that “safety laws are written in miners’ blood.” In 1917, it took disaster to force such basic safety measures as signage pointing the way to the surface. Today, it has taken Sago and other recent disasters to focus attention on such basic issues as adequate emergency oxygen supplies and rescue chambers. Q: What are the political parallels between 1917 and 2006? War led to significant new restrictions on civil liberties. Today the discussion centers around topics such as the Patriot Act and domestic wire-tapping. In 1917 the measures taken were much more extreme, and the North Butte disaster played a central role in the chain of events that led to some of the most severe restrictions on civil liberties in US history. The 1918 Anti-Sedition Act, which had direct ties to the North Butte disaster, essentially suspended the First Amendment right to free speech. Many “normal” American citizens were jailed – some for as long as twenty years – for criticizing US involvement in the war. An embarrassed Congress repealed the Anti-Sedition Act at the end of the war. Like Americans today, key players in Fire and Brimstone grappled with issues of separation of power. Today the issues include the appropriate judicial checks on executive power to perform domestic surveillance as well as the balance between executive and legislative powers (e.g., the recent FBI search of a congressman’s office). The North Butte disaster spawned a series of expansive executive powers both in Montana and nationally. The abuse of these powers witnessed by Burton K. Wheeler, then the federal district attorney in Butte, later prompted him to lead the 1937 fight against President Franklin D. Roosevelt’s effort to “pack” the Supreme Court (an act which many historians view as the most ill-advised action of FDR’s presidency). Q: How many men died in the North Butte disaster and why was the fire so deadly? A: There is some uncertainty as to how many men died. I have cited the number of 163 given in the official Bureau of Mines Accident Report. The number may have been higher. One Butte historian believes at least 167 men died. A number of factors contributed to the high death toll. As in many of the recent mining disasters, most of the fatalities occurred from carbon monoxide poisoning. The deadly gas, normally invisible and odorless, mixed with other gases in the North Butte disaster. Survivors reported being able to smell and even to taste it. Hundreds of miles of underground workings connected to the burning shaft, meaning that the gas spread quickly throughout the Granite Mountain mine and then into adjoining properties. There was no type of alarm system in the mine aside from verbal communication so many miners had no warning of what was happening. Adding to the death toll was the fact that miners were given no safety training, and many had no idea how to get out of the mine if a primary escape route was blocked. Even the most basic safety precautions were absent. For example, there were no signs marking the path to safety. Some exits were actually blocked with concrete walls to prevent smoke from an earlier fire in another mine from penetrating the North Butte properties. Q: Three groups of miners attempted to save their lives by entombing themselves behind improvised “bulkhead” walls, hoping to keep out the poisonous gas until rescuers could reach them. Was there any precedent for this action? A: Experienced miners in 1917 knew a lot about the danger of poisonous gas underground, often from frightening personal experience. Ernest Sullau, for example, the German miner whose accident sparked the North Butte disaster, had discussed the possibility of death by gas with his wife. For those North Butte miners who could not find a clear passage to the surface, the decision to entomb themselves (the miners called it “bulkheading”) was a logical – if desperate – option. The idea was to find a contained space place where the air was clear, and seal it off from the poisonous fumes. The victims in the recent Sago disaster, whose escape to the surface was blocked by smoke and gas, attempted to bulkhead themselves using a special “curtain” that is made for this purpose. In Butte, the miners had to grab whatever they could find: boards, canvass pipe, even their own clothing. With these materials, they attempted to construct an airtight barrier. One danger of a bulkhead was that the oxygen on the inside could only last for a limited time – which meant the clock was ticking. Q: How did you become interested in the story of Butte and the 1917 fire? A: I began looking for a good book topic when I moved to Montana three years ago. I had published an historical novel in 2002 (The Revenant, based on the true adventures of an 18th century frontiersman), and wanted to try narrative nonfiction. I started reading a lot of Montana history – which led me quickly to Butte. I also wanted a story set in a place within driving distance so that I could do lots of on-the-ground research. Butte is 120 miles (a short commute by Montana standards) from my home in Missoula. I first learned about the North Butte disaster itself when I visited the World Museum of Mining with my children. I was initially drawn by the sheer human drama – hundreds of men trapped below ground, desperately trying to reach the surface. The story became even more compelling when I began to learn about the political fire burning above ground, before and after the disaster. Q: How did you conduct the research for your book? A: I did most of my research on the ground in Butte. I only found one living person, a 95-year-old named Al Hooper, who had personal memories of the disaster. He was six in 1917, but can remember that his father, a carpenter, was pressed into duty to build coffins for the dead miners. I also interviewed several family members of miners involved in the fire. Most important were my interviews with Manus Duggan Banko, the daughter of the miner who is one of the heroes of the North Butte disaster. Born two weeks after the disaster, she is now an 89-year-old retiree in Fort Worth, Texas. Manus shared many stories about both her father and her mother, Madge Duggan, another hero in my book. I was also able to talk with many former Butte miners, including a number who had worked in the underground era. One ex-miner gave me a tour behind the locked gates of an abandoned Butte mine. Aside from interviews, my most important sources of information about the disaster were the Butte-Silver Bow Archives (housed in a turn-of-the-century firehall), the World Museum of Mining, and the Montana State Archives in Helena. In musty boxes and basement file cabinets I found a treasure trove of important original documents including contemporaneous newspaper accounts (Butte had three daily newspapers in 1917), the Bureau of Mines Accident Report, Coroner’s records, haunting letters and telegraphs written by family members of dead miners, photographs, and mining company records. Q: What aspect of your research surprised you the most? A: I was stunned to learn that, in 1917, Butte miners were working three-thousand feet below ground. There was a shocking contrast between the high degree of technology applied to extract copper-ore (gigantic steam engines, hydraulic drilling equipment, sophisticated chemical smelting processes) and the rudimentary consideration given to low-tech measures to improve miner safety (exit signs, open-flame lanterns, dust abatement). Q: What changes were taking place in the mining industry of 1917? How did they affect what happened during the fire? A: Profound change came to Butte mining in the two decades before 1917. Together they helped to create the volatile atmosphere in which the disaster took place. One important development was Standard Oil’s takeover of virtually all of the state’s copper resources between 1899 and 1906. Prior to the Standard Oil takeover, Butte’s three “Copper Kings” had maintained generally positive relations with miners and their unions. In fact, Butte’s labor unions were so strong that Butte, prior to the Standard Oil-era, was known as the “Gibraltar of Organized Labor.” Standard literally shut the unions down. With no unions, miners in 1917 were utterly powerless to protest for stronger safety measures. Other developments also set the stage for disaster. World War I led to a sharp increase in demand and therefore prices for copper. With prices higher, attention to safety became even less of a consideration. Immigration trends also played to the Company’s benefit. A new wave of immigrants from southern and eastern Europe created a near limitless supply of potential miners. Anyone protesting the working conditions in the mine was blacklisted – and easily replaced. These inexperienced miners, many of whom spoke no English, created their own safety hazard. Having no training, there were numerous incidents in which miners died (and/or caused the death of others) on their first day on the job. A: I am at work on a narrative nonfiction book called Last Stand: George Bird Grinnell, the Battle to Save the Buffalo, and the Birth of the New West. The book details the remarkable role of the buffalo in the American story, from prehistoric times to present, focusing on the period in the late-19th century when a small group of conservationists fought to prevent the species from being hunted into extinction. Last Stand’s human protagonist is George Bird Grinnell, a little-known sportsman/editor/conservationist who led the fight to save the buffalo, founded the Audubon Society, helped to save Yellowstone National Park, and led the effort to create Glacier National Park. In his remarkable life, Grinnell crossed paths with such notables as Buffalo Bill, George Armstrong Custer, and Teddy Roosevelt.